Lounging on a sun-bed is lovely. Sipping on a summery cocktail and having the ocean as our view? Well, that is the absolute best. 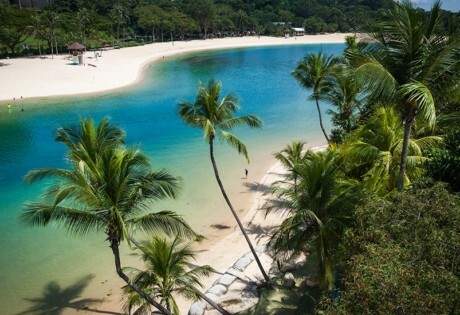 If you’re in need of a beach getaway but can’t squeeze in a quick escape from Singapore, these sandy bars, clubs and bistros in Sentosa and the East Coast are great for seaside siestas and even water sports. 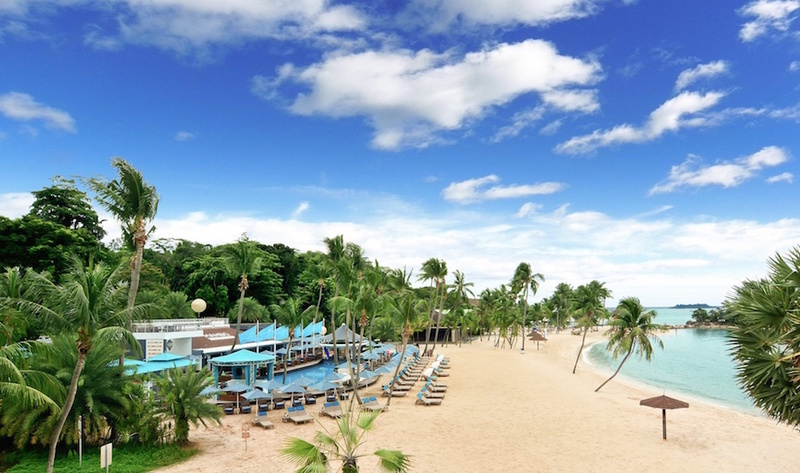 Topping our list is, of course, Tanjong Beach Club (pictured above). 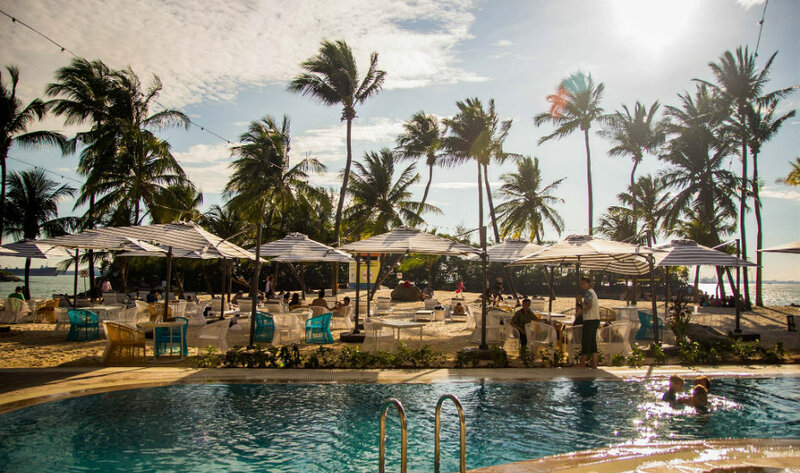 Named one of the world’s top 50 best beach bars, the plush daybeds, great grub, and sweet pool makes it a perfect spot to watch the sun sink and rise into tomorrow. We’ve also named it one of the best dance clubs in SG for good reason – their wicked carnivalesque parties with a slew of international DJs means we get our fix of weekend beach parties before ZoukOut rolls around again. Hit the waves at this iconic beach club where you can test out your surfing chops on the two artificial wave simulators – Flowrider and Flowbarrel – which suits both surf novices and adrenaline junkies. Tuck into easy, comfort food like pizza (with some long island tea on the side, no less) at the outdoor bar, or dine at the restaurant for the freshest seafood. Can you really say no to steamed mussels in garlic and a glass of wine? 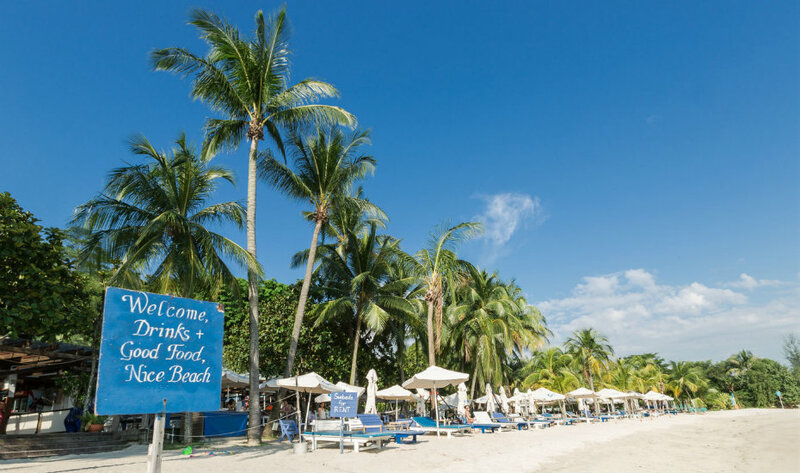 Part of five-in-one lifestyle destination C-Side, Coastes sits on Sentosa’s most lively beach but is surprisingly tranquil – perfect for dates and lunch with the kids. Rustic and charming with its white and blue decor, here’s where you can dine only a mere distance away from the sea. If you’ve got all day, rent a sunbed (complete with a table and an umbrella) and recline with a book and a drink in hand. A lazy afternoon at a beach bar doesn’t mean you have to skimp on a good meal, and Sandbank is proof of that – with a menu ranging from Western favourites like burgers and pastas to Asian-inspired sharing dishes like the oven-baked whole seabass (with a spicy sambal sauce!). If it’s tipples you’re after, you have a mind-boggling selection of beers, single malt scotch, cocktails and other liquors to choose from that will leave you doing snow angels in the sand. Fans of live music can enjoy regular gigs by the beach at Bikini Bar, while those who want to frolick away the afternoon can choose from a wide variety of ice-cold beers (make sure to check out the sweet bucket deals as well!). And, we hear that Bikini Bar has introduced some nibbles so fuel up before you booze up. Choose from tasty bites like deep fried luncheon meat kafti pastry, mini grilled pork burger with curry mayo, or split a duck & arugula pizza with your mates. 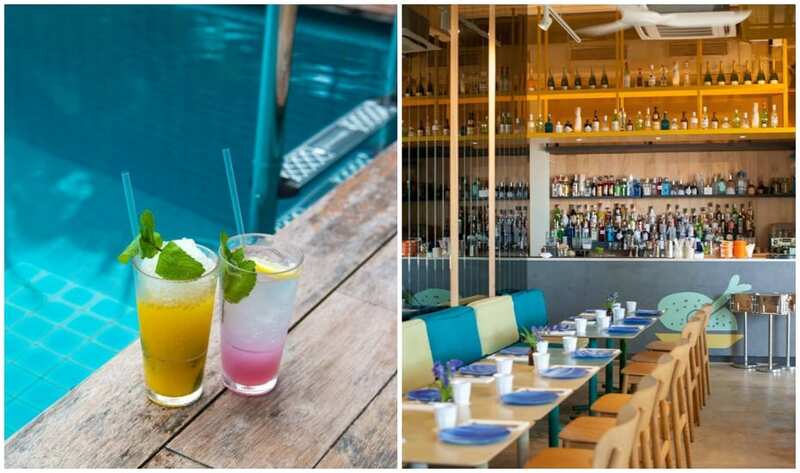 Forget burgers and seafood: This no-frills beachside bistro located in the breezy tail end of East Coast Park serves up an unconventional mix of Mexican and North Indian cuisine, perfect for refuelling after flexing those (wind) surf-wrecked muscles all day. Weekends are mad packed, so come early if you’re with a group. With its low-key ambience, comfort food (thunk slabs of beef steak and beer battered fish and chip galore) and ice cold draft beer, it’s no wonder the lads love this friendly neighbourhood bar. On Saturdays, the beach club transforms into part man cave, part stadium with its screenings of football games, rugby matches and F1. A lot of beach bars typically serve Western grub, but not this one. At Patro’s, you will be delighted by both Mexican and Indian cuisines – picture spicy Mexican wings and chicken tikka with your ice-cold beer. With a calming ambience and impeccable service, it also screens major sports championships in rugby, cricket and football. What better way to unwind? If you need a breather from the crowds at Tanjong Beach Club, you might want to check out this nearby seaside hotspot instead. A sister restaurant of FOC Hong Kong Street, it sticks to its Barcelona-inspired cuisine whilst adopting a Mediterranean style with its charming interiors. You’ll be staying for hours without a doubt. This is the place to be for all you music aficionados out there. Being a sweet spot for live music, it’s a must-visit on your Sentosa trip. 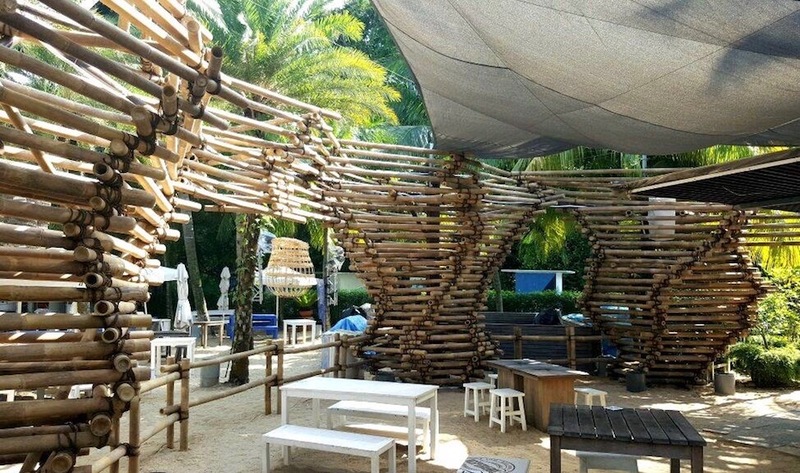 Groove away to relaxing tunes surrounded by stylish bamboo structures inspired by the legend of The Seven Dancing Princesses of Riau Island. Always dreamt of exploring the sands of Hawaii? Ola Beach club serves up Hawaiian-inspired cuisine like Ahi Poke and Kua’Aina Burger. Sip on cocktails served in their adorable tiki-themed mugs whilst lounging by their serene pool. Did we also mention this is the only beach club in Singapore that lets you use a water jetpack? Taking a cooling evening stroll along Pasir Ris Park? Be sure to stop by this bistro for some drinks, especially for its beer bucket deals that will be a hit amongst your booze-craving mates. Bunny hours are open till 9pm daily, so we strongly suggest you swing by for the golden hour of sunset. 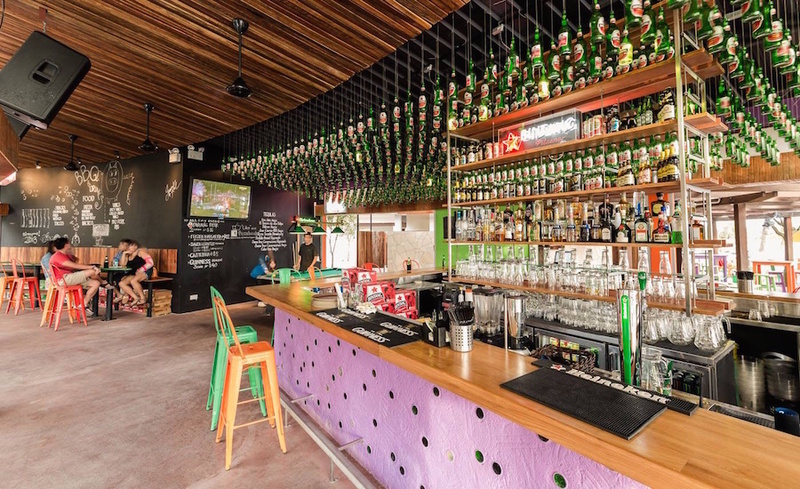 The Pasir Ris arm of this “friendly neighbourhood bar” has it all — it’s both a family restaurant and sports bar serving ice cold beers with classic grills. It’s the best place to chill out in this buzzy estate, whether you love live music, sports screenings or a game of pool. This serene hotspot is a favourite amongst the laidback crowds. It’s unpretentious, comfortable and perfect for when you need a break from the superstyled beach clubs. No need for stylish beachwear here; laze away (in whatever you please) on the sunloungers with a couple of frozen margs’ and crispy calamari. (Mambo Beach Club is now closed). This Miami-esque beachfront club located along Siloso Beach is great for mates and families looking for a laidback sundown experience. Inspired by iconic beach bars of the ’50s, Mambo serves up tasty beach grub, classic cocktails and a casual atmosphere. Sit back and sip on frothy beers while the kids frolic in the sand, or toast to a mini-beach getaway with your girlfriends as the sun dips into the horizon.